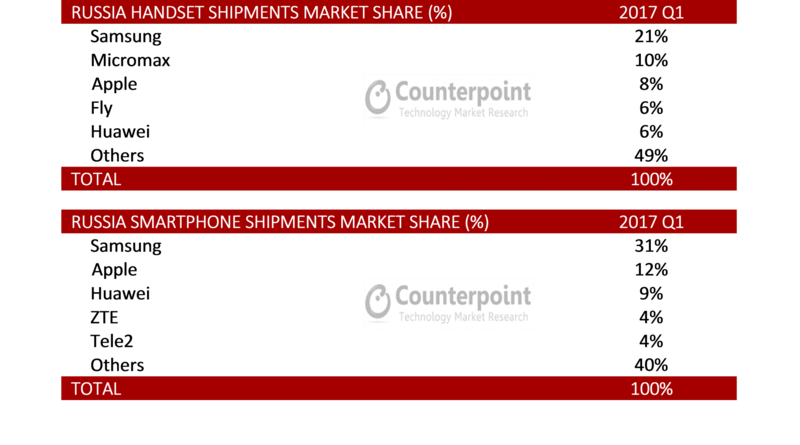 According to the latest research from Counterpoint’s Market Monitor service, Russia smartphone shipments grew 6% annually during Q1 2017 but declined 42% sequentially. 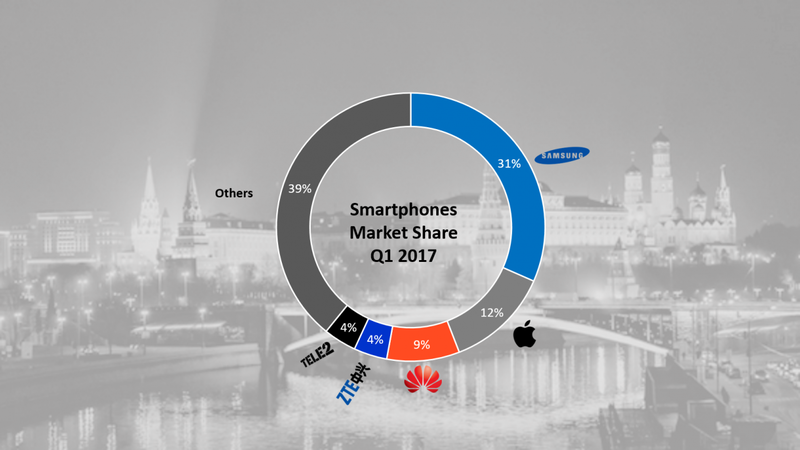 Russia’s handset and smartphone markets grew by 11% and 6% YoY respectively in Q1 2017. Samsung led both overall and smartphone segments with market shares of 21% and 31% respectively. Apple was the second largest smartphone brand in Russia with a market share of 12% by volume. However, the iPhones 5S still captured a quarter of Apple shipments. Samsung and Apple captured a record 2/3rd of the smartphone market by value. Huawei was the leading Chinese smartphone brand with a market share of 9% followed by ZTE with 4%. Both Huawei and ZTE were among the top five smartphone players in Russia capturing #3 and #4 places respectively. 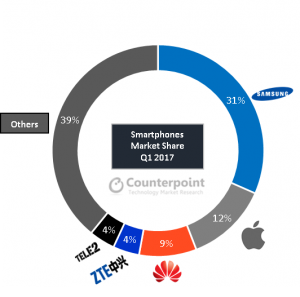 Global brands captured almost 55% of the smartphone segment followed by Chinese brands with a combined 26% share. Chinese brands are aggressively partnering with leading local mobile distributors in Russia to mark their presence in this growing market. Xiaomi, which entered the Russia market recently, is now ramping-up by developing offline sales channels and opening retail shops. Russian local smartphone brands grew by almost 101% YoY. Local brands like Tele2 (26%), Digma (24%) and Prestigio (13%) showed positive YoY growth. LTE capable smartphones contributed 71% of total smartphone shipments in Q1 2017. LTE smartphone segment in Russia increased by almost 64% YoY. Almost 24% of LTE smartphones were available in the $100-$150 price band. MediaTek embedded smartphones contributed to almost 39% of total smartphone shipments. Low-end smartphone segment ($100-$150) witnessed the highest growth of 24% YoY. Most of the growth is being driven by Samsung (51%), Bright & Quick (12%) & Tele2 (9%). 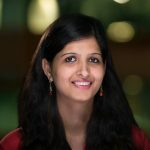 Premium segment >$600 grew a healthy 143% YoY. Apple and Samsung captured over 95% market share in the segment. Almost 52% of the smartphones shipped during Q1 2017 were Phablets (>=5 inch displays), which grew by almost 50% YoY. Over 15 new brands have entered Russia handset market in the past one year.